Once he got hooked on classical music, Bodkin fell in with a group of musicians studying at the New England Conservatory who would regularly put on house concerts. “Obviously this type of event has been happening for as long as there have been houses,” he said, “but it is such a departure from how most people experience classical music. “For me, and for so many people, music isn’t just about the sound — it’s about the social scene that goes along with it. Anyone can have a string quartet perform in their home because you don’t need amplification, all you need are four chairs. 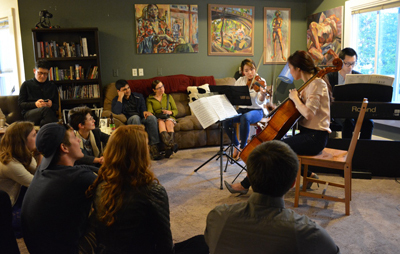 Push the coffee table aside and you can have great masterpieces performed in just about any apartment in any city. All of this led Bodkin to found Groupmuse, a New York City-based organization that creates “groupmuses” or classical music house parties that bring friends and strangers together to socialize and enjoy music in an informal setting. “Many people have great ideas, but the reason Groupmuse has become successful is the incredible people who have devoted themselves to this vision,” Bodkin said. In addition to Bodkin, the Groupmuse founding team includes Kyle Nichols-Schmolze of San Francisco and Ezra Weller of Boston. To date, four U.S. cities host regular groupmuses: Boston, New York, San Francisco, and Seattle. The inaugural Cleveland Groupmuse event, featuring In2ative (Kim Zaleski, flute and Trevor Kazarian, cello) and the Cleveland Cello Quartet (Carlyn Kessler, Anna Hurt, Eva Lauren Ribchinsky, and Sophie Benn), will be held in Lakewood on Friday, September 18 at 7:00 pm. The event is limited to 30 guests, each of whom is asked to donate $10 for the musicians and bring their own food and drink. Attendees must RSVP via this link on the Groupmuse website. All of the performers are either current students or alumni of the Cleveland Institute of Music. Kessler agreed. “I think that groupmuses create an equilibrium between the audience and performers, both figuratively and literally. Sometimes the stage can almost become a pedestal, and musicians often don’t get to interact with concertgoers. Groupmuses humanize the musicians to the audience. “Both Sophie and I have played informal performances that included conversation with the audience,” Kessler said, “and in almost every case, the listening experience was more engaging and enjoyable because it felt more personal. Groupmuse takes that concept to the next level. The music world is so much about friendship, and groupmuses are great opportunities for musicians to expand their social network.” Benn and Kessler agree that groupmuses are a great way for first­-timers to get their feet wet. Instead of going to a concert hall, they can attend a party in an informal setting that is a little less intimidating. Sophie Benn described how groupmuses typically unfold: “The first half-hour to an hour is all about socializing. People are encouraged to bring their own food and drink and just hang out and meet new people or talk to their friends. Then either Carlyn or I will invite people to gather for the first musical performance. There will be plenty of floor seating, as well as couches and chairs for those who prefer not to sit on the floor. Published on ClevelandClassical.com September 11, 2015.